HomeFeaturesHave your say: Who and where should England play in 2019? Have your say: Who and where should England play in 2019? England’s calendar for 2019 is up in the air at the minute, but we want to know if you think they should play at home or overseas next year. The Lions do not have any international fixtures pencilled in for next year at the minute, with talks believed to be ongoing. Wayne Bennett’s side this year will have played four Test matches by the end of it, all of them coming against New Zealand. They played the Kiwis in Denver in a mid-season Test back in June, while they are currently competing in a three-match Test series against Michael Maguire’s men in the north of England. There is talk of the Great Britain Lions returning in 2019 and them doing a tour of Australia but that has yet to be confirmed. Or would a Lions tour of the Pacific Islands be a better idea? However, reports Down Under have suggested that the Kangaroos will tour England next year for a three-match Test series. A lot of fans seem to want an Ashes series hosted in England or Australia next year, but it appears that the Kangaroos are not interested in playing the Lions and would prefer to play New Zealand or Tonga instead. New Zealand are facing Tonga in a mid-season Test next term and because England do not currently have a mid-season game in the bag, it is looking likely that England could face France – if they even have a mid-season game. 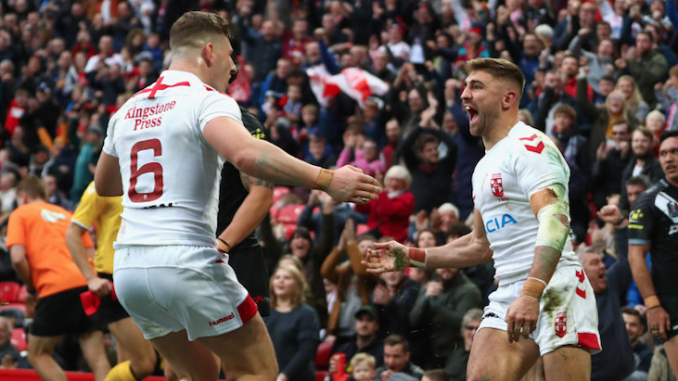 It appears that the Rugby Football League want attractive international games hosted in England in 2020 to build for the 2021 Rugby League World Cup. Who and where should England play in 2019? Let us know your thoughts in the comments below.